Often on twitter people take crap for no real reason. 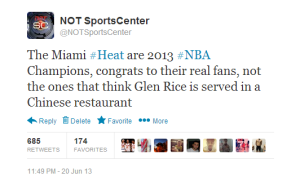 NOTSportsCenter is certainly on the list. Most grasp the concept that all of this is in good fun and nobody “hates” any teams or people. 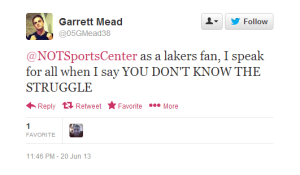 (or as we like to say, we hate everyone) Some do not and get a little…emotional. Often they’re really funny at how badly misspelled they are. Often other people crack on these people. Since they can often be quite funny, we’ve decided to give you a look inside our mentions on twitter/facebook, and do a little firing back of our own. If you haven’t seen this before, here’s the archive from April-June 2013 when this was Your A Idiot and then Yours A Idiot when the twitter account came along. This is what will be coming soon. To check out all the pages and pages and pages of idiocy, click the page numbers at the bottom. 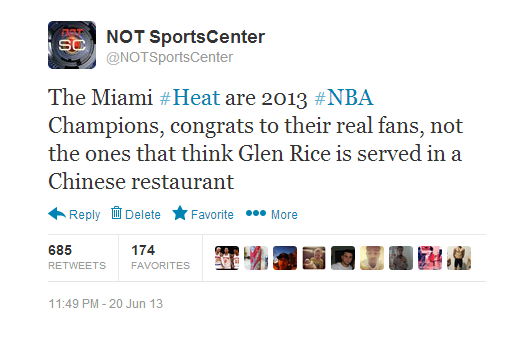 These tweets were in response to NOTSportsCenter tweets from Thursday June 20 and Friday June 21. You probably said “Heat” right? WRONG. 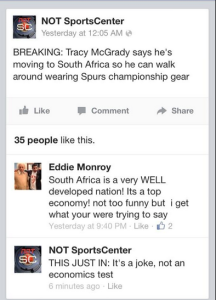 This was to a Tracy McGrady tweet. 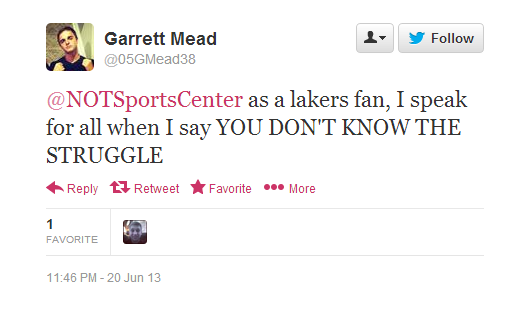 Apparently TMac fans are secretly fans of Jason Collins too. We said TMac was going to move to South Africa to be a champion. This guy has a comment on that. Oh they know better? You’ve been there and polled them all? It’s a joke, dumbass. Bye. Note how that’s from a guy, with the number 69 in his name. No words. Kissing each other? They’re sisters and sluts, not inbred sisters. Or maybe they will be at some point to promote another reality show. Who knows. These next two weren’t mentions mad about something, but they were too funny not to include. No, no we don’t. Funny. Two days later, still no luck yet. Maybe he’ll get one sometime soon. It feels fine. We’ll continue to make jokes about everybody, you can continue to whine about it, we’ll continue to mock you here. 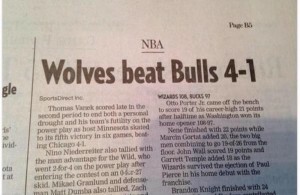 But keep whining Heat fans. It’s what (some) of you do best. Too bad you can’t get paid to do that eh? Would be a lot easier for you than that “school” thing.